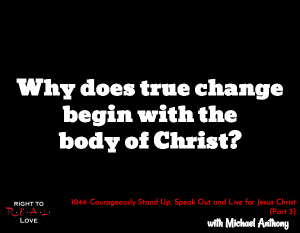 In this episode, Jay continues his discussion with pastor and author Michael Anthony by addressing the question: Why does true change begin with the body of Christ? Why does true change begin with the body of Christ? Why believers in Jesus Christ need to rediscover the importance of courageous humility. The value of truth and love. How to increase our level of biblical courageousness. The danger of withholding the truth and not sharing it with someone who needs it. Why true change begins with the body of Christ. Acknowledge that biblical courage is a reflection of your intimacy with God. Commit to spending intimate time with God and reading His Word everyday.